The most important price in an economy is the exchange rate between the local currency and the world’s reserve currency — the U.S. dollar. As long as there is an active black-market (read: free market) for currency and the data are available, changes in the black-market exchange rate can be reliably transformed into accurate estimates of countrywide inflation rates—if the annual inflation rates exceed 25%. The economic principle of Purchasing Power Parity (PPP) allows for this transformation. Using this principle, I compute implied annual inflation rates using high-frequency data and report them on a daily basis. For the countries that I monitor daily, the table below shows the annual rates for the eight countries with the highest inflation rates in the world. At present, Venezuela is suffering from hyperinflation. It holds down the top spot on my list, with an annual inflation rate of 16,428%. Note that my measurement of the implied inflation rate is much higher than the widely reported International Monetary Fund’s (IMF) end-of-year forecast of 12,870% (13,000% rounded). I measure; the IMF foolishly forecasts. A comparison of my measurements with the IMF’s projections for the other seven countries’ year-end annual inflation rates shows that the IMF's projections are way off the mark. Indeed, my current measured inflation rates for “today” exceed those that the IMF projects, with the exception of South Sudan's, by a wide margin. Given these large divergences and the IMF’s poor record of forecasting inflation in countries experiencing elevated inflation rates, one wonders why the financial press reports the IMF forecasts, and why it does so with such reverence. Let’s take a closer look at just how rapidly Venezuela’s prices are rising, and how they stack up against other hyperinflation episodes in Latin America (see the table below). Last month, the monthly inflation rate—yes, the monthly—reached a new high of 234%. At this rate, prices doubled every 17.5 days. 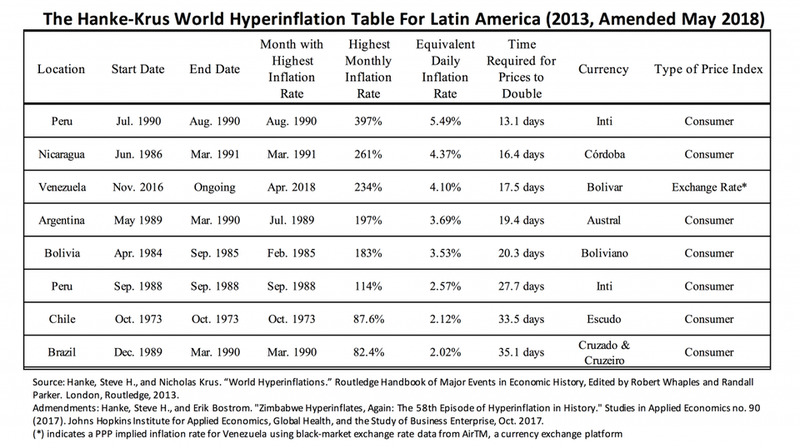 The table below is a condensed version of the Hanke-Krus World Hyperinflation Table for the episodes of hyperinflation in Latin America. Contrary to popular opinion, there have been relatively few hyperinflation episodes in Latin America: only eight, with two of them occurring in Peru. Venezuela’s death spiral continues to spin, as hyperinflation slashes the value of the bolivar. We can’t forecast the course or duration of Venezuela’s hyperinflation episode, but unless the government dumps the bolivar and replaces it with the greenback, as the Venezuelan populace has already done, this episode of hyperinflation could easily become much, much worse. After lunch at the Faculty Club at The Johns Hopkins University campus, Steve Forbes, Elizabeth Ames, and I (Steve Hanke) retired to the library to tape an interview for a one hour documentary, “In Money We Trust,” that Steve Forbes is putting together. The documentary is sparked by Money (McGraw Hill, 2014), a book authored by Steve Forbes and Elizabeth Ames. Much ink has been spilled recently about how economic sanctions have crushed the North Korean economy and brought its leader Kim Jong-un to the bargaining table. Not so fast. For starters, there wasn’t much to crush. Never mind. And, contrary to repeated conjectures by experts in international affairs, whatever there is of a North Korean economy appears to be quite stable.